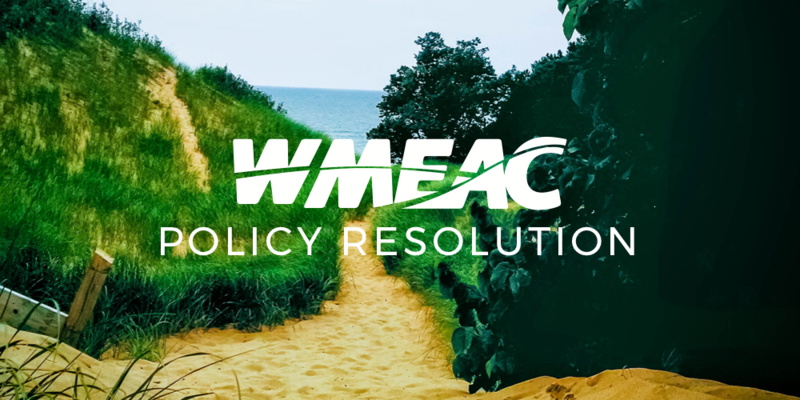 Since May 2017, the West Michigan Environmental Action Council’s (WMEAC) Policy Committee and staff have been working with the Saugatuck Dunes Coastal Alliance (SDCA) to provide capacity and feedback in their efforts to protect the Dunes from inappropriate and potentially harmful development of a 6.54 acre boat basin with a capacity to berth 51 boats and a channel connecting to the Kalamazoo River. Careful consideration has been given to thoroughly collect and review information from a number of sources including, 1) The formal site plans proposed by the new property owners and DEQ applicants; 2) The Tri-Community Master Plan documenting the vision and legal framework for development as adopted by Saugatuck Township and the Villages of Douglas and Saugatuck; 3) The existing literature documenting the environmental, economic, and cultural value of the site; 4) Attending public meetings and hearings; and 5) Holding monthly calls with the SDCA. Currently, the site development plans for the boat basin and channel are being reviewed by the Michigan Department of Environmental Quality (MDEQ) and U.S. Army Corps of Engineers (USACE). Additionally, the legality of the decision by the Saugatuck Township Planning Commission to allow the development plans to move forward is being challenged in Allegan County Circuit Court. Therefore it is an opportune time for WMEAC to formally adopt a position on this regionally critical and potentially precedent-setting issue. This allows the Board and staff to be clear with volunteers, members, and partners in their intention to have the organization pursue the issue further. Part 353 of Act 451, the Michigan Natural Resources and Environmental Protection Act, and the Tri-Community Master Plan both codify the need for a balanced approach to development that considers the environment, public interest, property rights, and economic impact. The current proposal calls for the removal of 241,750 cubic yards of sand from a 285,000 square foot area. This will fundamentally change the character of the dunes, potentially impact the historically significant buried town of Singapore, and damage other culturally significant artifacts such as a Native American burial ground which is believed to be on the site. As enshrined in the Tri-Community Master Plan, these are vital assets to the local community both economically and culturally. Therefore they must be taken into consideration during any development process. Currently, they are not addressed in the plans or application even though there have been feasible and prudent alternative designs presented that would preserve the property owner’s right to pursue a return on their investment and protect the public trust. The Environmental Impact Statement (EIS) as submitted with the application to the MDEQ is inadequate and incomplete. Under the Threatened and Endangered Species Concerns portion of the Statement, the applicants noted they conducted a Bird Survey in May 2017 and a Rare Species Survey in August 2017. Their findings are summarized as, “The study area was not found to be of critical use by any state or federally listed endangered or threatened species,” and that no rare species or habitat for rare species were observed on the property. There have been a number of ongoing formal and informal studies of the area by academics and hobbyists alike that would dispute those findings. Specifically, they can be contradicted by the results of a survey done in 2008 as part of a DEQ application to have the area classified as a Designated Environmental Area. In that survey the applicants found, 1) At-risk birds: Sixty-seven of the 208 species observed in the study area are designated as Endangered, Threatened, Special Concern species, or belong to the category of Neotropical Migratory Birds. 2) At-risk aquatic life: The Kalamazoo River Mouth section of the river provides important habitat for over 100 species of fish, including the Lake Sturgeon. 3) At-risk terrestrial habitat: The survey found there are both imperiled and rare ecosystems in the area as defined by the Natural Features Inventory. There has been no demonstration of a plan to deal with the change in hydrology of the site or contamination risk that digging up 241,750 cubic yards of sand and redistributing it both on the beach and near the critical dunes area will have. Near the proposed basin is an area designated as an interdunal wetland. This is critically important habitat for birds, amphibians, reptiles, and plants alike. These wetlands have specific topographical, geologic, and hydrologic characteristics which could easily be impacted at this site when that amount of sand is removed and redistributed. In addition, the basin and subsequent structures will alter the natural hydrology of the site by (according to the site plans) redirecting rain water to underground catchment basins, rather than allowing it to filter through the ground and recharge the wetland areas. Moreover, the proposed footprint for the basin lies over the former Broward Marine yacht manufacturing site. Like most legacy industrial sites in Michigan, there are concerns of soil and sediment contamination even though the physical structures were long ago removed. There could be disastrous impacts if contaminated sand or soil were allowed to be removed and distributed along the shoreline for “beach nourishment” or “stockpiled” next to the critical dune area and then used in “future construction” on-site as the plan suggests. The Board of Directors of the West Michigan Environmental Action Council is appealing to the Michigan Department of Environmental Quality to deny both applications relating to the proposed marina basin and road on the property along the Kalamazoo River in Saugatuck Township.